"Observations on Different Kinds of Air." Philosophical Transactions of the Royal Society of London. 1772. 62: 147-264. 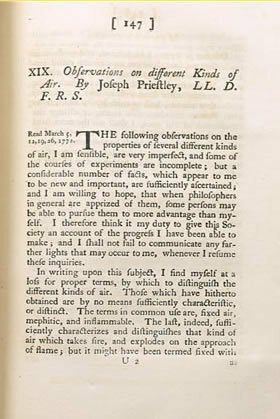 This is the first appearance of Joseph Priestley's work on gas theory, published in the Philosophical Transactions two years before being separately published. Priestley is credited with having discovered a number of gases, including oxygen, nitrous oxide, and ammonia, as well as hydrochloric acid and nitric acid. The Royal Society, of which he was a member, awarded him the Copley medal.